All the amenities you’d expect from a five–star resort. Some of the Northwood’s most spectacular backdrops for family reunions to corporate retreats and simple getaways. 10,000 square feet! Sleeps up to 26 people! Far enough from ordinary but close enough to be practical. 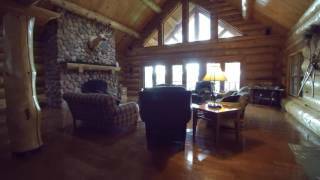 The lodge has 70 acres of private land and 4000' of lake shore including a private island. You are 1/4' mile from the nearest residence so you feel like you have your own lake. Spectacular sunset views! Your own private beach with dock and sand volleyball court. Private hiking trails and plenty of opportunity to view wildlife, you are almost certain to see Eagles, Grouse and Deer. Explore our private island, snowmobile trails start on lake in winter, ATV trails nearby, river rafting nearby, cross country skiing. Beach volleyball, shuffle board table in game room. Ping Pong/Table Tennis. Foosball. Pool Table. Of course swimming, fishing and boating on the lake, or sitting around the campfire and just relaxing on the deck make for busy days. $5,900 per week (up to 20 guests). $25 per night per guest over 20 guests. There is a $100 dollar cleaning fee added to 2 and 3 day rentals. Cleaning is included in longer rental rates. Weekly lodging runs from Saturday through Saturday. Check in at 4:00 PM, check out at 10:00 AM. We do not rent the lodge for weddings, proms, school reunions, bachelor parties, etc due to use limitations on the facilities. We have only two weeks open this summer, June 1-8 and Aug 24-31 we are offering $1000 off the weekly rate for either week!